Discs lie between the spinal bones (vertebrae). They serve as shock absorbers. Discs protect the spine and help it stay flexible. 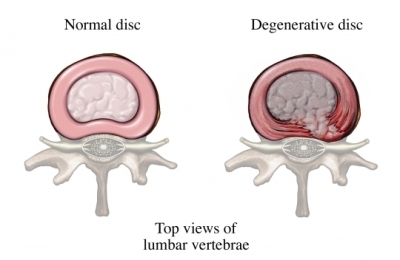 Degenerative disc disease is wear and tear on these discs. This wear and tear causes pain and other symptoms. Some degeneration is normal as you age. Not all degeneration will result in symptoms of this disease. The disc loses fluid and is not as resilient as a normal disc. The fibrous tissue, which holds the disc material in place, may suffer small tears. These tears lead to further damage. There is some evidence that genetics may play a part for some people. Your nerves may be evaluated. This can be done with an electromyogram and nerve conduction studies. Steroid injections may be used for some short-term pain relief. They are injected around the nerves exiting the spinal cord. Surgery may be required for some. Surgery may involve removing the degenerated disc and fusing 2 of the vertebrae together. If you have osteoporosis , follow your doctor's instructions for treating the condition. If possible, make changes to your workplace to reduce symptoms, such as using proper posture and safe methods of lifting. Bogduk N, Anat D. Degenerative joint disease of the spine. Radiol Clin North Am. 2012;15(4):613-628. Degenerative Disc Disease. Hospital for Special Surgery website. Available at: https://www.hss.edu/condition-list%5Fdegenerative-disc-disease.asp. Accessed November 12, 2017. Low Back Pain. Ortho Info- American Academy of Orthopaedic Surgeons website. Available at: https://orthoinfo.org/en/diseases--conditions/low-back-pain. Updated December 2013. Accessed November 12, 2017. Lumbar disk herniation. EBSCO Dynamed Plus website. Available at: https://www.dynamed.com/topics/dmp~AN~T116077/Lumbar-disk-herniation . Updated September 6, 2017. Accessed November 12, 2017. Madera M, Brady J, Deily S, et al. The role of physical therapy and rehabilitation after lumbar spinal fusion surgery for degenerative Disease: a systematic review. J Neurosurg:Spine.2017:26(6):694-704. Paassilta P, Lohiniva J, et al. Identification of a novel common genetic risk factor for lumbar disk disease. JAMA. 2001;285:1843-1849. Urban J, Roberts S. Degeneration of the intervertebral disc. Arthritis Res Ther. 2003;5(3):120-130.